Summer is singing its noon song. Spring just past is a restless season, the time of planting and hoping, but summer brings the peace of fulfillment. Mid July, is the half-way stile between the first cautious growth of June and September’s ripening. Former Curator Martha Crone. In early summer, from June to mid-July, after the spring glory has passed, the Woodland Garden continues to provide beauty while the Upland Garden is putting forth its first full burst of colors. 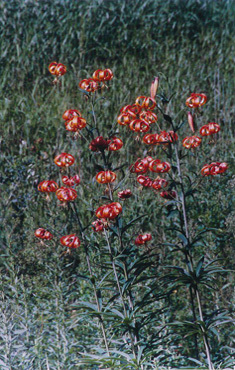 More photos of each plant and additional plant information can be found at the link on the plant name. Alternate common names for plants are listed in ( ). 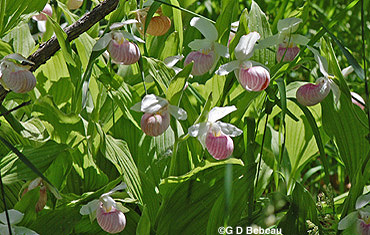 Showy Lady's Slipper (Cypripedium reginae Walter). Family: Orchis. One of the jewels of the early summer Garden. The Minnesota state flower. About the end of May phone calls begin coming to the Martha Crone Shelter asking when they will bloom. Each year is different but a week centering around June 10th is usually good. The latest date has been June 18 and the earliest May 24. There are several clumps of this plant and the bloom time is always a little different. 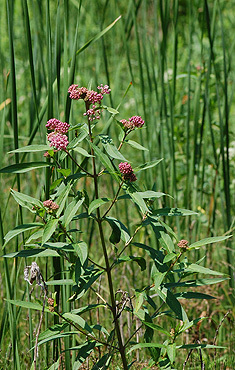 Swamp Milkweed (Asclepias incarnata L.). Family: Milkweed. 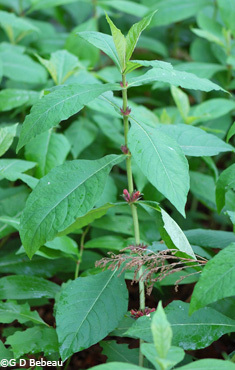 A common plant on the wetland path in the Woodland Garden with beautiful pink flower heads. 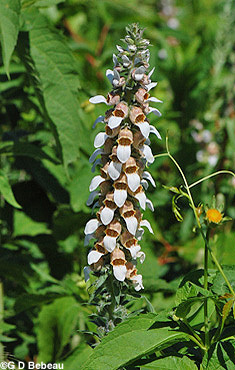 Grecian Foxglove (Digitalis lanata Ehrh.). Sometimes found in the Upland Garden in several places - invasive, but under control. A brilliant Turk's cap lily (Lilium superbum L.) in the Upland Garden. 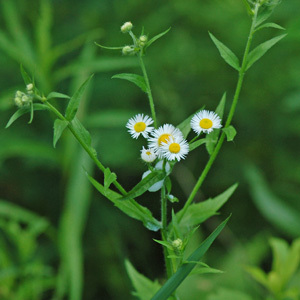 Eastern Daisy Fleabane (Erigeron annuus (L.) Pers.). Family: Aster. Found in both the Woodland and the Upland Garden. A common Minnesota plant, that easily self seeds and therefore is sometimes hard to control in a home garden. 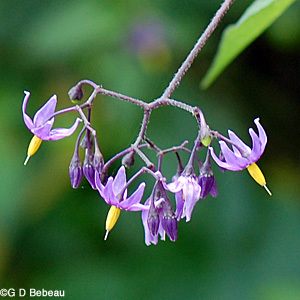 Climbing Nightshade (Bittersweet Nightshade) (Solanum dulcamara L.). Family: Nightshade. Found in the Woodland Garden. A vine without tendrils that grows near other plants for support. 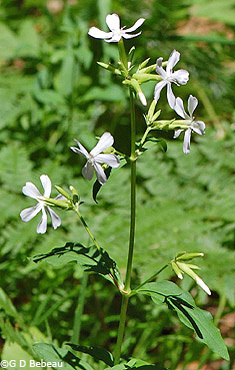 The ends of the stem with the flower clusters are usually self supporting. Common Buttonbush (Cephalanthus occidentalis L.). Family: Madder. A unique shrub, located near Guidebook station 23 and 25 in the Woodland Garden. 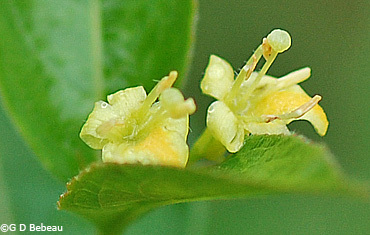 Northern Bush Honeysuckle (Diervilla lonicera Mill.). Family: Honeysuckle. A small shrub with yellow flowers at the tip of the stems (sometimes pink). Upland Garden. Horse Gentian (Triosteum perfoliatum) L. Family: Honeysuckle. The small flowers appear in the leaf axils. They are reddish-purple and stalkless. In Autumn yellow-orange berries are quite noticeable. Bouncing Bet (Soapwort). 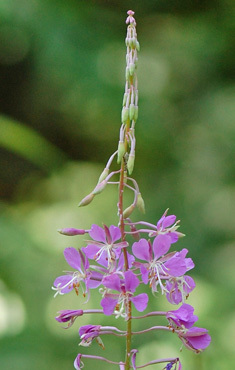 (Saponaria officinalis L.) Family: Caryophyllaceae (Pink). 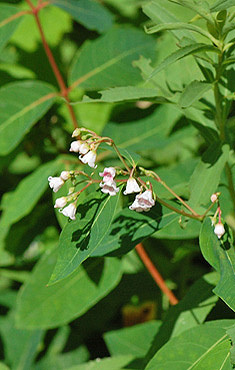 A plant whose attributes have a long and old history particularly in the Fuller's trade. The blossoms have a pleasantly strong smell. 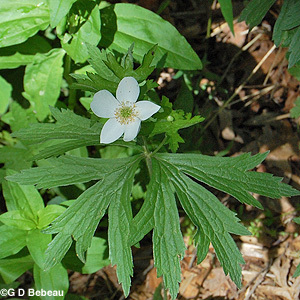 Canada Anemone (Anemone canadensis L.) Family: Buttercup. Found in the Woodland and extensively in the Upland Garden. Unlike the other Anemones in the Garden, this one usually does not bloom until June. 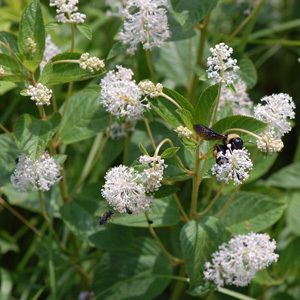 New Jersey Tea (Ceanothus americanus L.). Family: Buckthorn. Found in the Upland Garden, it is a woody plant that begins blooming near the end of June. Golden Alexanders (Golden Zizia) (Zizia aurea L.) Family: Parsley. One of the earliest yellow flowers to appear in the Upland Garden, always by mid-June but in an early spring, a few can sometimes be seen in late April. 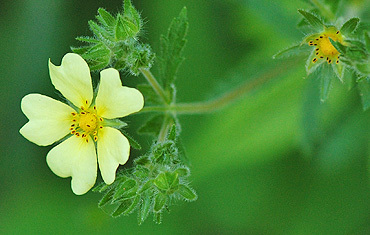 Rough-fruited Cinquefoil (Potentilla recta L.). Family: Rose. An introduction from Europe, now in all but 3 States, in Minnesota found mostly in the eastern 1/3 of the State. Prairie Dogbane (Indianhemp) (Apocynum cannabinum L.). 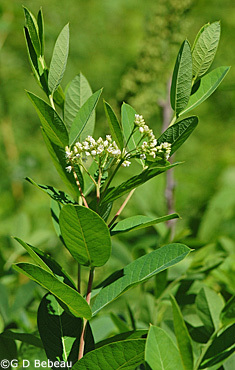 Family: Apocynaceae (Dogbane). Found in the Upland Garden, the plant has a long medicinal history, listed in the U. S. Pharmacopoeia from 1831 to 1916 and thereafter in the NF (National Formulary) until 1960. Spreading Dogbane (Common Dogbane) (Apocynum androsaemifolium L.) Family: Apocynaceae (Dogbane). Found in the Upland Garden, the flowers resemble a bell with a white to pinkish 1/3 inch long corolla of 5 lobes, whose upper lips recurve outward. 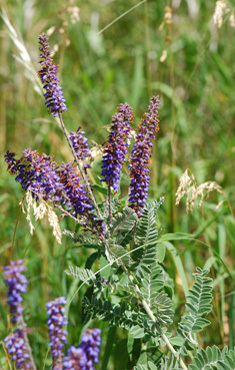 Leadplant (Amorpha canescens Pursh.) Found in the Upland Garden. This is a shrub of the uplands and prairies. It is highly drought tolerant due to a deep tap root.